These birds are commonly known as Scarlet Chested Parakeets, Splendid Parakeets, Scarlet Breasted Parrots, or Orange-Throated Parrots. Like most hookbills, they are true parrots, even though they are often referred to as parakeets. The Scarlet Chested Parakeet is a type of grass parakeet that is native to Southern and Western Australia. 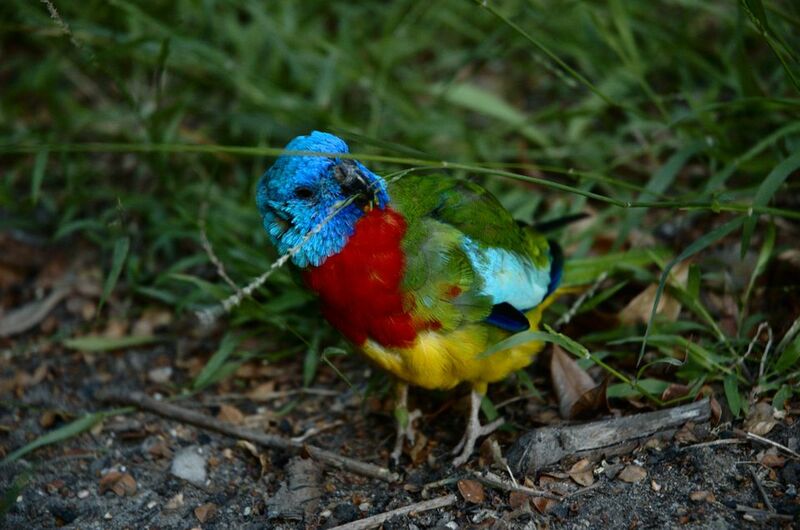 However, captive breeding programs have introduced these beautiful birds to pet homes around the world over the years. Scarlet Chested Parakeets are small birds, normally measuring around 8 inches in length from head to tail. At maturity, they generally weigh less than 2.5 ounces. In general, a well cared for Scarlet Chested Parakeet can live for between 10 and 15 years in captivity, although there are always exceptions who will have shorter or longer lifespans. If you are considering adopting one of these birds, it is always best to plan for the longest lifespan possible. While it is certainly possible to tame a Scarlet Chested Parakeet, for many years they were considered by most to be an "ornamental" bird, basically meaning that they should be seen and not touched. This has been proven to be an untrue stigma surrounding these birds, as many Scarlet Chested Parakeets have become tame and loving pets over the years. It is worth noting, however, that some bird experts consider these birds to be among the more temperamental types of parakeet, who may not enjoy handling as much as other types of birds. Scarlet Chested Parakeets are also rumored to be one of the more quiet hookbills, preferring to softly chatter among themselves rather than resorting to screams and loud contact calls. Couple this trait with their small size, and they could be an ideal pet for those living in apartments or condominiums. Scarlet Chested Parakeets exhibit a brilliant rainbow of colors in their plumage. They are a sexually dimorphic species, so males and females are colored differently. Mature male Scarlet Chested Parakeets have dark blue faces, red chests, and bright green on their backs and the tops of their heads. They have yellow bellies and sky blue feathers on the undersides of their wings. Mature females also have blue faces, green wings and backs, and green chests. Like the males, they also have yellow feathers on their bellies. Scarlet Chested Parakeets in the wild normally eat a diet consisting mainly of grasses and seeds found in the fields where they live. This is supplemented by other offerings available throughout the seasons, including flowers, fruit, insects, and berries. In captivity, they seem to do quite well on seed mixes formulated for small parrots or parakeets, with supplementation of canary seed and sunflower seed. They also enjoy and thrive on fresh foods and particularly sprouts and leafy greens like spinach and kale. These types of vegetables should be offered daily, as well as bits of fruits like apple, banana, and orange. Scarlet Chested Parakeets spend a lot of time on the ground foraging for food in the wild. To emulate this behavior in captivity, it is suggested that they be provided with plenty of foot toys in a secure, bird-proof area that they can play in outside of their cages for 3 - 4 hours per day. Potential owners should make sure that they are able to provide supervision for their birds while they are out of their cages each day. While they aren't the best pets for everybody, Scarlet Chested Parakeets can make excellent companions for the right people. With time, patience, and proper bonding techniques, they can be loving and affectionate pets who are very socially involved with their owners. If you're interested in learning more about whether or not a Scarlet Chested Parakeet would be a good addition to your family, the best thing to do is contact your local aviculture society or a nearby Scarlet Chested Parakeet breeder. This way, you can describe your home and lifestyle to people who are familiar with the species and get sound advice on whether adopting one of these birds would be a good option.